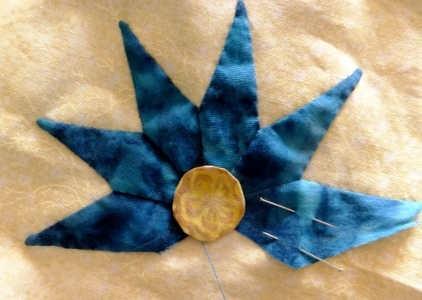 Needle Turn Applique Circles » What's Under the Needle? 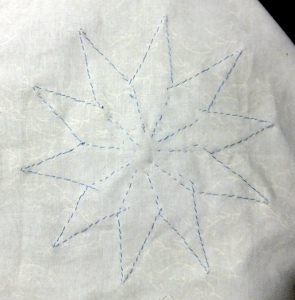 I start with my freezer paper template and press it to the wrong side of the fabric. 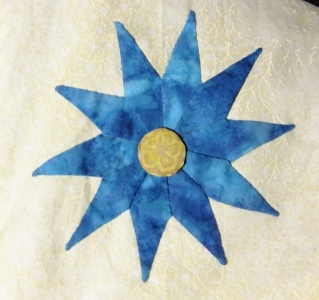 This one I centered over a small flower on the fabric just to make it a little more interesting, watch for that when I turn it over to the front later on. Now cut it out leaving a small seam allowance - 3/16" is all you really need, unless you have a fabric that frays a lot, then you might want it to be a little wider. 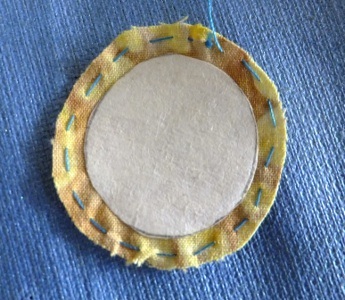 The next step, which a little different than we learned in a previous post, is to make a small gathering stitch around the outside of the circle within the seam allowance. 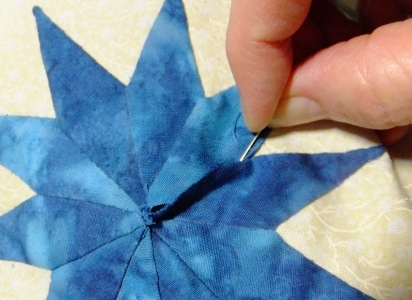 Try to get as close as possible to the edge and keep the stitches small. 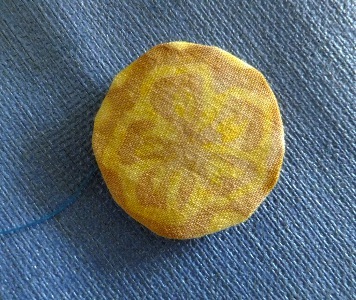 I usually use the same color thread I'll be stitching the circle on with, but this time I wanted to use a contrast so it would show up in the photo. 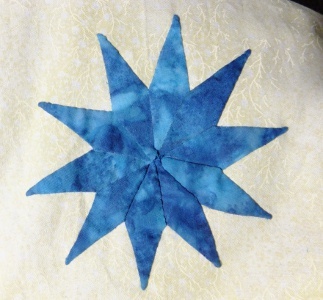 Stitch completely around the circle and then gently pull the thread tight so the seam allowance gathers and pulls in toward the center. 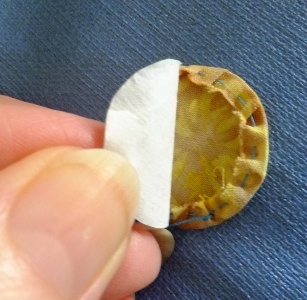 Make sure the gathers are smooth around the edge of the freezer paper, then give it a press to make a nice crisp edges to the circle. Check the front to ensure there is no points, use your needle to smooth any puckers away and then press again. 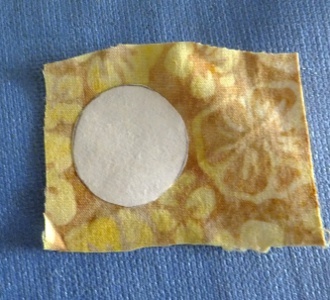 After a good press, gently remove the freezer paper. I prefer to take it out now, especially on these tiny circles. 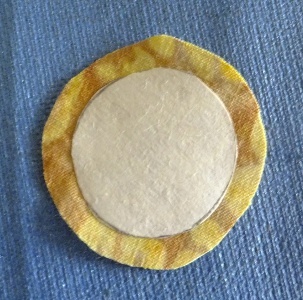 Another method is to stitch it in place and then cut out the background from underneath to remove it. 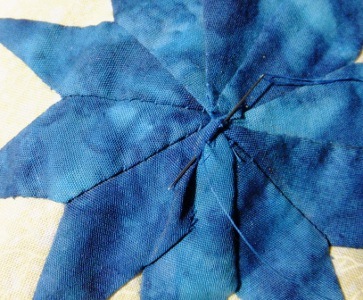 Now we are ready to stitch it to the flower using those tiny stitches. 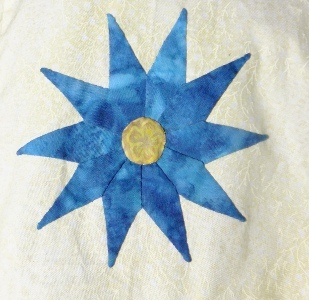 Did you notice the flower design on the fabric? 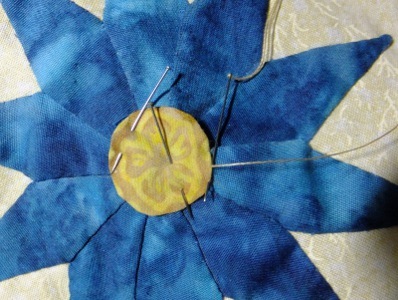 ....but wait, I'd better stitch the rest of those petals on first. And stitch it in place. All done. don't worry about these raw edges in the middle, they will be covered soon. Let's add the center. That looks better with all the petals in place! 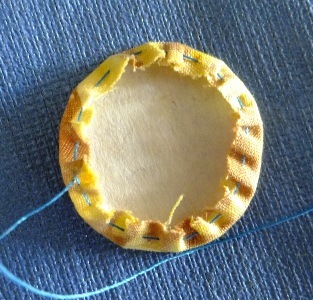 Use a couple of pins to hold it in place while you stitch - careful you don't prick your finger like I did! And this is how the back looks. 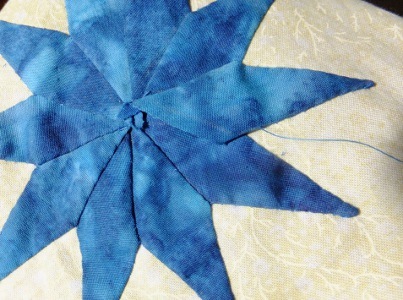 Are you stitching along too? The points on this flower are the hardest of all so be sure you trim back the excess seam allowance before tucking it under.